Galway’s Enda O'Coineen completes his solo circumnavigation of the globe sixteen months after starting. Well-known Galway sailor, Enda O’Coineen has completed his solo circumnavigation of the world some 17 months after starting. O’Coineen arrived on Sunday afternoon off the west coast of France, crossing the finishing line of the Vendee Globe course he had started on November 6, 2016. But just two months into the event O'Coineen broke his mast 180 miles south of New Zealand, which ended his race. Undeterred O'Coineen wanted to finish what he started. 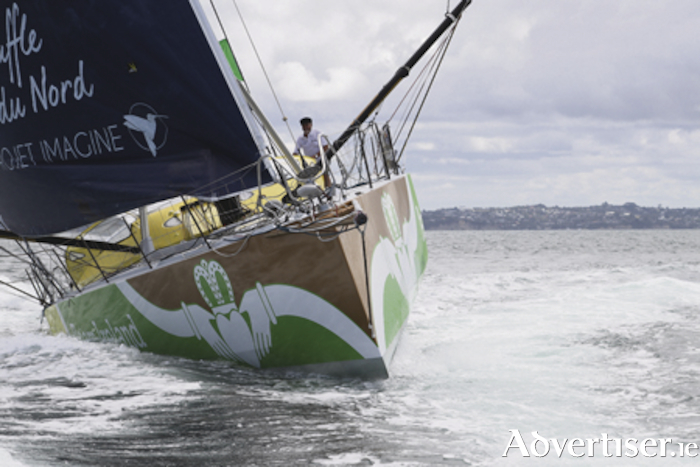 He joined forces with a French boat that also had been forced to stop in New Zealand, and continued his solo effort under the banner Le Souffle du Nord Kilcullen Team Ireland. Although officially ruled out of the race, O’Coineen set sail from New Zealand in January, and completed the final 13,000 miles journey to Les Sables d’Olonne - the starting point of the Vendee race-some 66 days later. An elated O’Coineen described the completion of his adventure as "incredible". "I'm overwhelmed, and now I'm surrounded by thousands of people who gave me an amazing welcome into Les Sables d'Olonne. It's an honour to be here and to be representing Le Souffle du Nord Kilcullen Team Ireland. "The support, interest and encouragement has been great. This adventure really started in January 2015," he said, and had "gobbled up a range of personal emotions, physical challenge, personal resource, fear and jubilation in between." "There is no logic to the logic. Right to the finish line for the final week, rounding the Azores and the north west corner of Spain, the storm crossing the Bay of Biscay, kept me on edge." No Irish person has been able to follow Britain's Sir Robin Knox-Johnston who first sailed alone non-stop around the planet some 50 years ago, but O'Coineen, stop or no stop in NZ, joins an elite group of sailors to have circumnavigated the globe alone.